It’s hard work keeping up with chef Gaggan Anand, whether you’re trailing him between rows of produce at the At Or Kor market on the northern fringes of Bangkok, driving behind his red BMW 3-Series as he guns it on the highway or scanning his prolific travels on Instagram. Indian-born Anand, (“a Punjabi from Kolkata,” he says), runs the top-ranked restaurant in Asia, his eponymous Gaggan in Bangkok, which has sat at the top of Asia’s 50 Best Restaurants for three consecutive years. It sits at a plum number seven on the 2017 World’s 50 Best Restaurants list and in December 2017, Gaggan was awarded two Michelin stars in the inaugural edition of the Bangkok Michelin guide. There is a touch of chutzpah and rock-and-roll to Anand’s decision to shutter Gaggan for good in 2020, a decade after its birth. The move seems somewhat glamorous and has garnered tons of press to date. It's fitting that Anand, a former drummer, has a brand of cooking that, in its exploration of India’s street food and home-cooked classics, takes inspiration from progressive rock music. Queen, Led Zeppelin and Pink Floyd circulate on his iPhone playlist along with The Foo Fighters and The Rolling Stones. “People have called me mad,” he says of the flavor and textural combinations he serves at Gaggan, likening it to the unexpected compositions by his favorite musicians. The latest menu is presented in emoji format, and showcases Anand’s deft touch and irreverence – consider the “blood” splattered lamb chop called "Who Killed the Goat? "; uni ice cream dolloped in a dinky seaweed cone; goat brain served as "Indian foie gras" and an exploding sphere of salty yogurt, the latter being an Indian kitchen staple. In keeping with the example of his mentor, Ferran Adrià, who closed down El Bulli – a temple to molecular gastronomy in Catalonia – at the height of its fame, Anand remains resolute. “I am peaking right now and the best lesson I ever learned from Ferran was to leave in the peak. I have fame already. I want to climb a new mountain, but you can’t go from top to top. You have to come down, get out of your comfort zone and sacrifice everything,” he says. 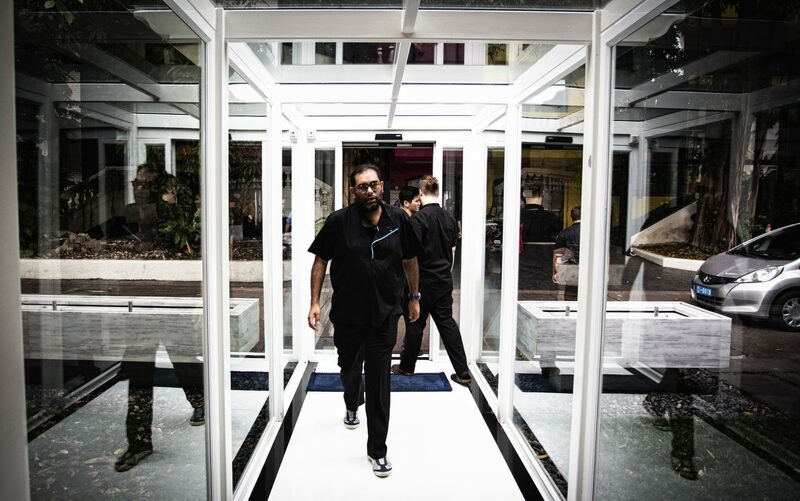 It’s helpful to delve into Anand’s complicated journey to success before he opened Gaggan. He’s quick to point out, as documented in his Chef’s Table episode, that it hasn’t materialized overnight. He was scooped up by the Taj Group fresh out of culinary school in Kolkata, followed by a soul-draining, number-crunching catering business he’s christened his “grey time,” a fine-dining restaurant stint in Bangkok after a divorce from his first wife and some time down the line, the untimely death of his brother. Today, Anand jets around the world on a range of collaborations with the world’s glitterati of chefs, if he’s not hosting them at Gaggan’s lab upstairs. In late June 2017, Slovenian chef Ana Roš of Hiša Franko brought a taste of her hometown to meet Anand’s chili pepper challenge. In December, head chef and owner Jorge Vallejo of Quintonil in Mexico City, collaborated with Anand in a playful Mexico vs. India showdown, featuring a much talked-about course called "Lick it Up," where guests did exactly that. Gaggan regulars know that the majority of these dishes are eaten with one’s hands, a homage to Anand’s Indian culinary heritage. In addition to Gaggan, Anand has been investing in the talent of friends and colleagues, resulting in the wildly successful one-star Michelin German fine dining restaurant Sühring by twin brothers Mathias and Thomas Sühring; a "comfort food" wood-fire restaurant called Meatilicious run by Anand’s Thai wife, Pui; Gaa headed by ex-Noma chef Garima Arora. And, soon to open: a handmade tofu omakase restaurant, and Wet – a natural wine and fried chicken bar by Gaggan head sommelier, Vladimir Kojic. While Anand looks to India for “my fantasy, my art,” Japan has long stolen his heart for what he calls “the zen of cooking” and his minimalistic approach. He is set to open a small-table restaurant in Fukuoka, Japan called GohGan with long-time collaborator, chef Takeshi Fukuyama, of La Maison de La Nature Goh. “It’s amazing; it’s a different thing when I cook with him,” Anand says, adding that he hopes to have GohGan, a split-level former temple, running on the August 22, 2021. “That’s the date we first cooked together. It’s also my wife’s birthday,” he adds. The idea, he explains, is to travel every alternate month between Japan and Thailand where his wife and daughter, Tara, will remain.